Adrian Colyer is Venture Partner at Accel Partners, London Author of 'The Morning Paper'. He previously held CTO roles at SpringSource, VMware, and Pivotal. I’m sure you’ve come across the term “Cloud Native” to describe an approach to IT which assumes and embraces the characteristics of cloud platforms. While cloud-native has been stealing all the attention recently, there’s another shift that’s just as important: the move towards becoming a “Data Native” organisation. 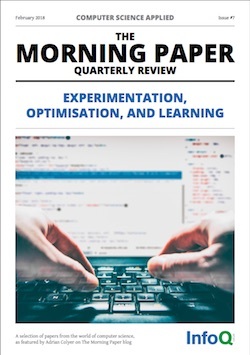 For this edition of The Morning Paper Quarterly Review I’ve chosen a set of papers that illustrate what the data natives are up to: how they embed experimentation, optimisation, and learning into everything they do. If you thought continual delivery was the end game, for data natives this is just the necessary pre-requisite. You’ll learn some of the hard-won lessons from running thousands of experiments a year across Bing, MSN, Skype, Office, and Xbox, as well as from firms like Amazon, LinkedIn, Booking.com and Microsoft. If you are involved in product design, particularly on web-based applications, there is a tremendous amount of value in this issue. InfoQ.com is facilitating the spread of knowledge and innovation in enterprise software development. InfoQ content is currently published in English, Chinese, Japanese and Brazilian Portuguese. With a readership base of over 1,400,000 unique visitors per month reading content from 100 locally-based editors across the globe, we continue to build localized communities.